Eyelid surgery, called blepharoplasty, is a surgical procedure to improve the appearance of the eyelids. Surgery can be performed on either the upper and lower lids, or both. Whether you want to improve your appearance or are experiencing functional problems with your eyelids, eyelid surgery can rejuvenate the area surrounding your eyes. Remember that the eyelids are part of the face. 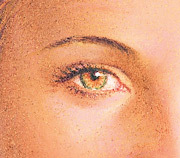 The appearance of a drooping upper lid may also be due to relaxation of the forehead skin and eyebrow. Sometimes a drooping eyelid is caused by stretching of one of the upper eyelid muscles, the levator. Your plastic surgeon will evaluate your anatomy thoroughly to determine the causes of your eyelid appearance, and what procedures might best remedy them. Eyelid surgery may be performed in an accredited office-based surgical facility, outpatient or licensed ambulatory surgical center, or a hospital. Be sure to arrange for someone to drive you to and from surgery and to stay with you for at least the first night following surgery. Be sure to ask questions. It’s very important to ask your plastic surgeon questions about your eyelid surgery. It’s natural to feel some anxiety, whether it’s excitement for your anticipated new look or a bit of preoperative stress. Don’t be shy about discussing these feelings with your plastic surgeon. The incision lines for eyelid surgery are designed so the resultant scars will be well concealed within the natural structures of the eyelid region. 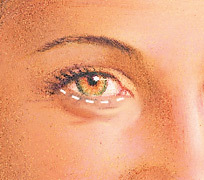 The upper eyelid can be corrected through an incision within the natural crease on the eyelid. This allows for removal or repositioning of fat deposits, tightening of muscles, and removal of excess skin. A transconjunctival incision, created on the inside of the lower eyelid, is an alternate technique to correct lower eyelid conditions and redistribute or remove excess fat. With this technique, no skin is removed. The decision to have eyelid surgery is personal, and you’ll have to decide if this surgery will achieve your goals, and if the potential risks are acceptable. Be sure you understand the surgery and recuperation completely, and don’t hesitate to ask your plastic surgeon questions. You will be given specific instructions that may include how to care for your eyes, medications to apply or take orally to aid healing and reduce the potential for infection, specific concerns to look for at the surgical site or in your overall health, and when to follow-up with your plastic surgeon. Initial healing may include some swelling, bruising, irritation or dry eyes, and discomfort that can be controlled with medication, cold compresses, and ointment. Irritation at the incision sites is also possible. 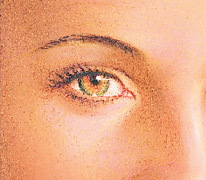 The results of eyelid surgery will be long-lasting. Your final results will appear within several weeks, but it may take up to a year for incision lines to fully refine. While eyelid surgery can be expected to correct certain conditions permanently, you will continue to age naturally. Life-long sun protection will help to maintain your results. Satisfaction with your new image should continue to grow as you recover from surgery. As swelling and bruising subside, the results of eyelid surgery will reveal a smooth, better-defined eyelid and surrounding region and an alert and rejuvenated appearance. Following your physician’s instructions is essential to the success of your surgery. It is important that the surgical incisions are not subjected to excessive force, abrasion, or motion during the time of healing. Your doctor will give you specific instructions on how to care for yourself. Prices for eyelid surgery can vary. A surgeon’s cost may be based on his or her experience, the type of procedure used, and geographic location. Many plastic surgeons offer patient financing plans, so be sure to ask.